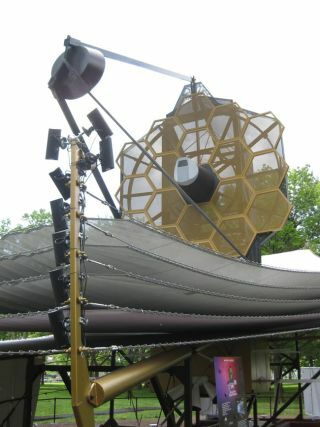 A life-size model of the James Webb Space Telescope, set to launch in 2014, is on display at New York's Battery Park June 1 through June 6, 2010. NEW YORK ? NASA's latest big-ticket space observatory ? the JamesWebb Space Telescope ? took center stage alongside space and science luminarieson Tuesday here at the World Science Festival. The festival's opening ceremonies were held at Battery Park,where a giant life-sized model of the observatory will be displayed all weekfor the public to see. "It's exciting and humbling to stand next to this modelof the JamesWebb Space Telescope," said famed physicist Brian Greene, co-founderof the World Science Festival. Greene spoke to an audience of about 150 New York publicschool students who came to view the model and learn about the future of U.S. spaceexploration. The World Science Festival will include science-themedlectures and events throughout the city from June 2 through June 6. A galaperformance on Wednesday featuring Alan Alda, John Lithgow, Yo-Yo Ma and othercelebrities will honor physicist Stephen Hawking. The $5 billion James Webb observatory, envisioned as the successorto the HubbleSpace Telescope, will launch in 2014 to scan the skies in infrared light.Scientists hope it will reveal some of the youngest galaxies in the farthestreaches of space, helping to solve some fundamental cosmic mysteries such ashow the universe formed. The mockup, built by prime contractor Northrop GrummanAerospace Systems, stands 40 feet (12 meters) tall, with a heat shield the sizeof a tennis court. "It's really thrilling ? it makes it so tangible thatwe can really do these things," Greene told SPACE.com. Also on hand at the ceremonies was NASA's deputyadministrator Lori Garver, who said she hoped James Webb's appearance in NewYork might help to build its image as a future space observatory. "Everyone's very excited for this telescope tolaunch," Garver told SPACE.com. "I think we have every hope that asthe Webb telescope gets ready to launch, people understand this really is thatnext generation. It's a real exciting time and a significant program forNASA." The students also got to meet a real-life astronaut, formerNASA spaceflyer John Grunsfeld, who visited the Hubble Space Telescope duringthree separate space shuttle missions. Grunsfeld now heads the Space TelescopeScience Institute in Baltimore, Md. A big difference between Hubble and its successor, he said,is that JamesWebb is designed to travel much farther out in space, to a point about amillion miles away from Earth, which is about four times farther than the moon. At that distance, it won't be feasible for astronauts to hopinto a spacecraft and visit if the telescope needs an upgrade. "With the Hubble,I always felt like if something goes wrong, it's OK, we'll just go fixit," Grunsfeld said in an interview. "With the Webb Space Telescope,if something goes wrong, that's really bad. What that means is that theengineers and designers have to be that much more careful." Still, NASA is researching novel means of space propulsionfor future manned missions, so it's not completely out of the question thatastronauts could one day travel to the Webb, though that's not the currentplan. "We have, in NASA's history, done the amazing," Garversaid. "We never say never at NASA." The telescope is a cooperative effort among 15 nations, withprimary contributions from NASA, the European Space Agency and the CanadianSpace Agency. Europe will aim to launch James Webb in mid-2014 on an Ariane 5rocket from Kourou, French Guiana. "It's a wonderful feeling now we're in sight oflaunch," said John Mather, James Webb Space Telescope senior projectscientist. "We're actually building the parts."